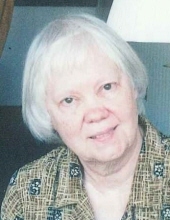 Elaine C. Shadix, 85, of Bloomington, passed away at 5:30 p.m. Sunday, April 7, 2019 at Advocate BroMenn Medical Center, Normal. Her funeral will be at 11 a.m. Wednesday, April 10, 2019 at St. Mary’s Catholic Church, Bloomington. Burial will be in St. Joseph Cemetery, Peoria. Visitation will be from 10:30 to 11:00 a.m. Wednesday, April 10, 2019 at the church. In lieu of flowers, memorials may be made to the Neighborhood House, Peoria. She was born June 19, 1933 in Spring Valley, a daughter of Charles and Veronica Corpus. She married Charles E. Shadix on June 25, 1960 and he survives in Bloomington. Also surviving are her children, Mike Shadix of Manchester, GA, Chris (Mark) Sopek of Lake Zurich and John Shadix of Peoria; and two grandsons, Stephen and Paul Sopek. She was preceded in death by a daughter, Charlotte Marie Shadix. Elaine was a lifelong homemaker and a devout member of St. Mary’s Catholic Church. "Email Address" would like to share the life celebration of Elaine C. Shadix. Click on the "link" to go to share a favorite memory or leave a condolence message for the family.